This blog has featured a series of articles on restoration of the former (and future!) Warren Falls, located in the Starvation Creek area. 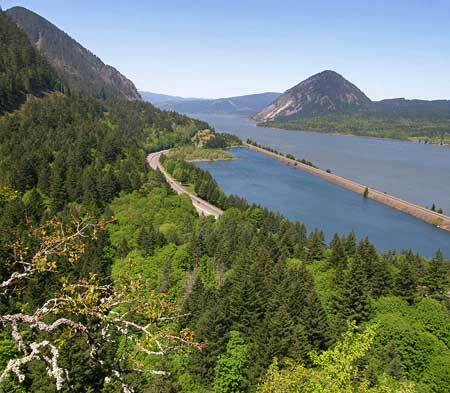 But there is a lot more to see in this interesting and less-traveled corner of the Columbia River Gorge, and this loop hike explores an amazing variety of scenery on a short, but demanding circuit. 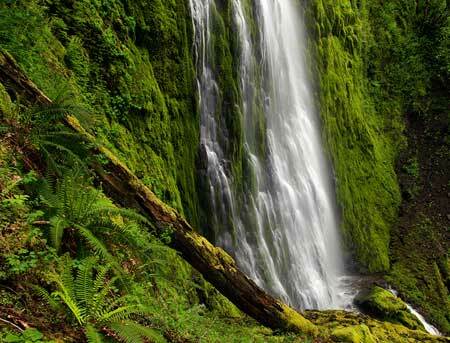 Along this way, you’ll see four waterfalls, one “dormant” waterfall, ford two creeks, visit hanging meadows, peer over the brink of some truly breathtaking cliffs and enjoy expansive views of the Columbia River Gorge. You’ll want to print the large version of the trail map, below, as the trail network in the area is dense, and trail signage unreliable. 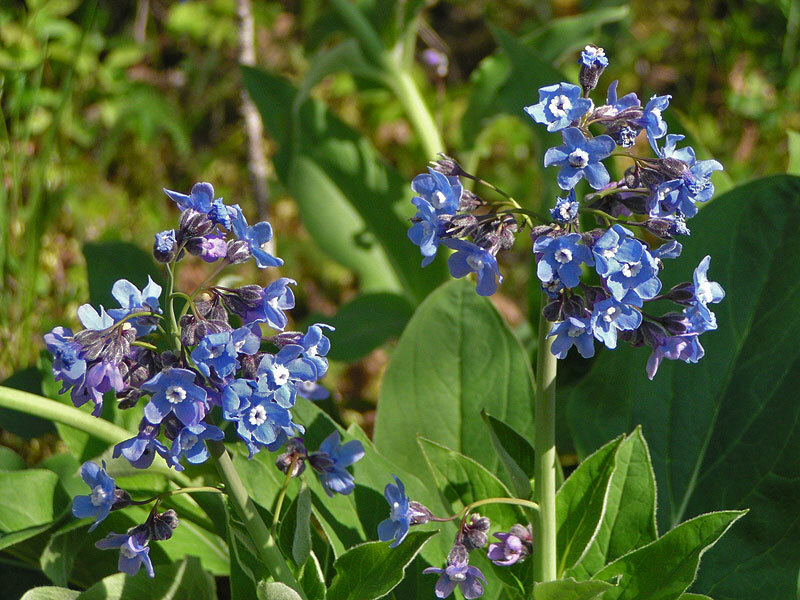 The hike is best done from late April through early November, as the conditions can be somewhat treacherous in icy winter conditions, and the stream fords difficult in winter and early spring. But for adventurous hikers, this loop is generally open year-round, and provides a nice hiking option when snow covers the high country. 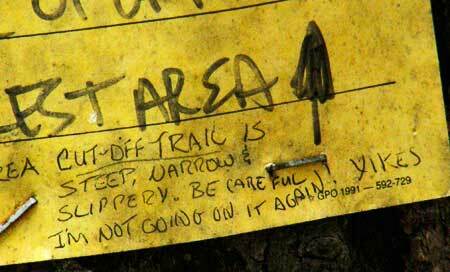 Hiker’s grim warning on a temporary sign at the Starvation Ridge Cutoff Trail..! Note that the loop described here follows a specific direction, tackling the very steep Starvation Ridge Cutoff Trail first, in the uphill direction. This might seem counter-intuitive, but the steepness of this path is much harder on your knees going down than on your lungs and legs going up — and it can feel a bit slick and sketchy to descend, due to the steepness and exposure. 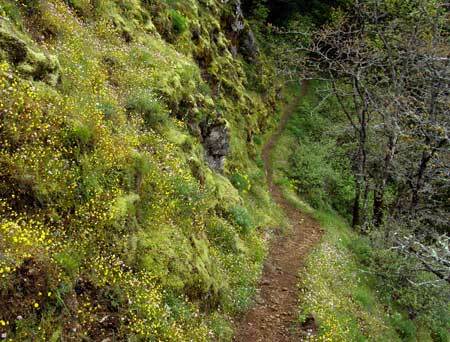 The trail begins at the Starvation Creek Trailhead (directions at the end of this article). Head west from the parking area, walking parallel to the freeway exit, then drop into the trees following a section of the old Columbia River Highway. ODOT will soon be restoring this section of highway as part of a state recreation trail, so watch for construction to begin soon. 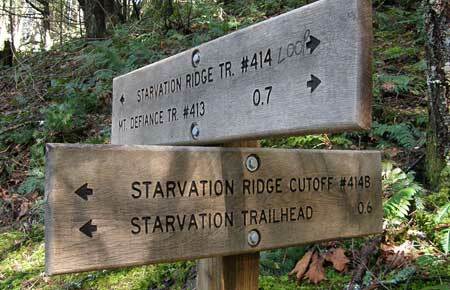 A short distance from the trailhead, you’ll see a signboard on the left marking the Starvation Ridge Cutoff Trail No. 414B (if you reach Cabin Creek Falls, you’ve gone too far). Take a deep breath, and begin the stiff climb up this trail, as it threads its way in a series of switchbacks through the towering cliffs that frame the Starvation Creek area. Soon, the trail curves into the upper canyon of Cabin Creek, leaving the sounds of the freeway behind, and continuing steeply above the creek into dense forest until you reach the signpost marking the upper junction with the Starvation Ridge Trial No. 414. The main loop heads to the right (west), and crosses Cabin Creek. But before you continue in that direction, make a brief detour to the left (east), following the Starvation Ridge Trail uphill for about 200 yards to a spectacular cliff-top viewpoint, a few feet off the trail. From here, you can peer a dizzying 500 vertical feet down to the trailhead and the tiny cars, trucks and freight trains moving below. After resting your legs (and lungs) from the Starvation Cutoff trail, and enjoying the sweeping view from the overlook, retrace your steps back to the junction, and continue west on Trail 414, fording Cabin Creek. From here, the route climbs from the Cabin Creek canyon in a series of short, well-graded switchbacks, and passes another towering cliff-top viewpoint on the right. The trail soon crests a divide marked by a 1930s-vintage transmission tower, and descends into Warren Creek canyon in a series of switchbacks traversing an enormous hanging meadow. 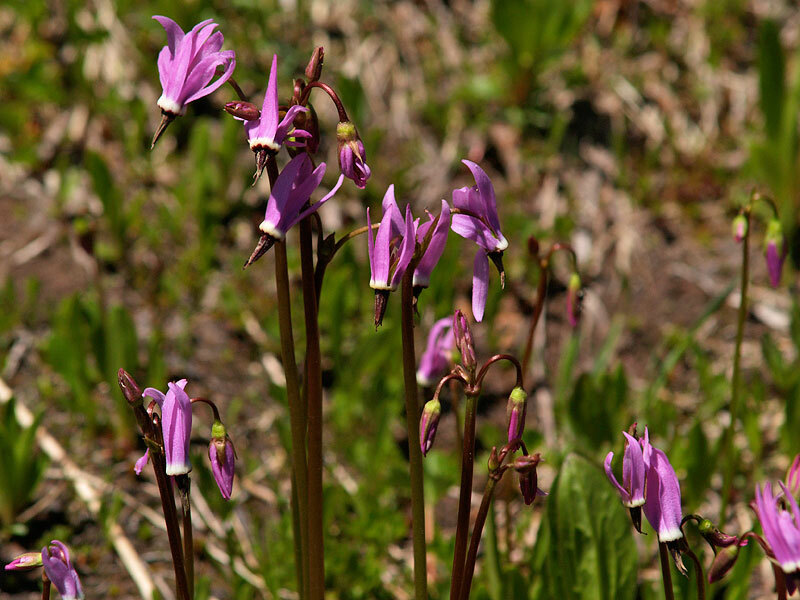 In late April and May, the meadow features beautiful displays of shooting star and other wildflowers, but offers stunning views any time of year. Soon, the trail re-enters forest, then reaches Warren Creek, a potentially difficult ford in winter and early spring. There’s no bridge here, so cross carefully. 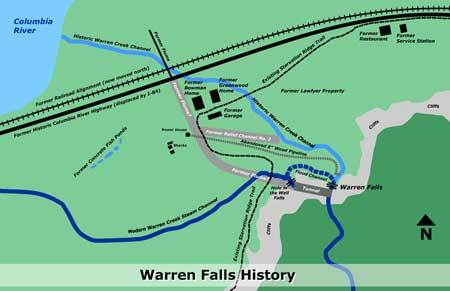 Warren Creek is the stream that once flowed over Warren Falls, just downstream from the ford. Since 1939 it has been diverted through an odd bypass tunnel that now forms manmade “Hole-in-the-Wall Falls”. You’ll pass both later on the hike. 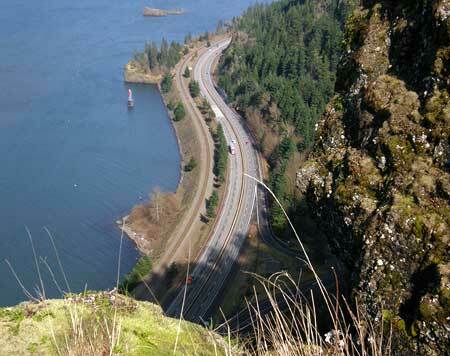 From Warren Creek, the trail makes a gentle traverse along the forested canyon wall, then turns and crests another ridge below a second transmission tower, before descending across another open area with terrific views of the Columbia River Gorge. The trail now descends to a 3-way junction of the Starvation Ridge (No. 414) and Mount Defiance (No. 413) trails, poorly marked with a very old signpost. 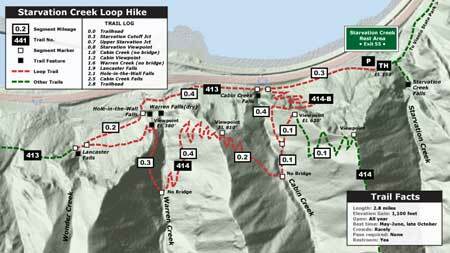 From here, the loop hike continues to the right, turning steeply downhill. 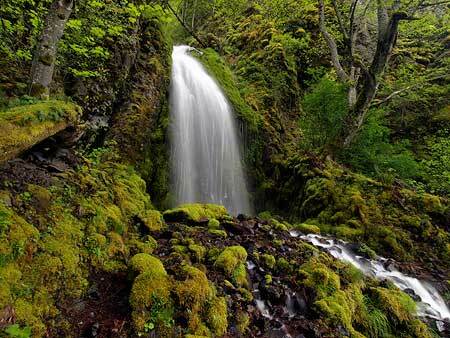 But first, go straight 200 yards to beautiful Lancaster Falls on Wonder Creek. 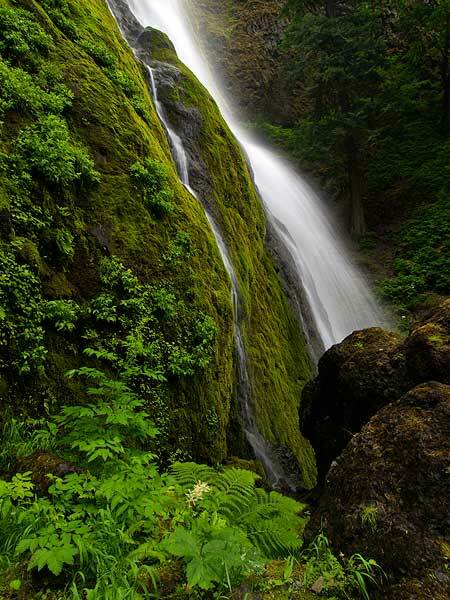 This magnificent waterfall is named for Samuel Lancaster, the visionary engineer who designed the Historic Columbia River Highway. The best trailside view of Lancaster Falls is from the west bank, so be sure to rock-hop your way across. From there, you can also see part of the tall, lacy main tier of this beautiful waterfall (if you’re feeling really adventurous, it’s possible to scramble to a close-up view of the upper tier by heading uphill from the trail, just east of Wonder Creek). After cooling off at Lancaster Falls, backtrack to the 3-way junction, and rejoin on the Starvation Ridge Trail No. 414, heading left as it descends steeply across an open slope, soon reaching a sturdy, new footbridge over Warren Creek. You’ll have views of man-made Hole-in-the-Wall Falls from the bridge, but waterfall lovers should take a few minutes to follow the obvious boot path that parallels the dry streambed to the left of the falls. This streambed leads to the original, natural location of Warren Creek Falls — the topic of several articles on this blog. The hauntingly quiet amphitheater of the original falls is eerie, and it’s easy to imagine the sound and spectacle that once existed when Warren Creek poured over this cascade. 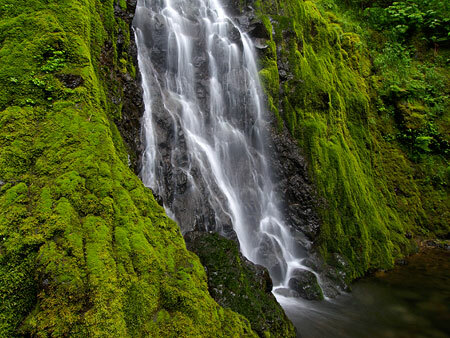 During the periods of heavy winter runoff, Warren Creek occasionally overtops the diversion tunnel, and briefly flows down its natural falls. If you look closely, you’ll see evidence of winter storm events that have briefly brought the original falls and streambed back to life. After taking in the scene at the former Warren Falls, retrace your steps on the boot path to the footbridge and turn right, continuing along the main trail for your return to the trailhead (note: the restored Historic Columbia River Highway and trail will soon be constructed in this area, with a new trailhead for the Starvation Ridge Trail relocated to this spot). The route briefly passes an open area, and then re-enters forest. Watch for old, stone foundations covered in ivy in this area — you’re passing turn-of-the-century homesteads lost to time. Sharp-eyed hikers will also spot a pair of enormous anthills, each measuring six feet in height. A bit further, and you’ll also pass dome-shaped stone bake ovens, possibly built in the early 1900s by highway workers (see the map below for help in finding these traces of human history in the Warren Falls area). Finally, the trail rejoins the abandoned section of the old highway, following it to lovely Cabin Creek Falls. Photographers should take a moment to walk the short boot path to the base of the falls to capture the exceptionally beautiful scene. Crane your neck upward, and you will see the huge cliffs to the left of the falls that you skirted above on the Starvation Ridge Cutoff Trail! To complete your journey, continue along the old highway grade back to the trailhead. 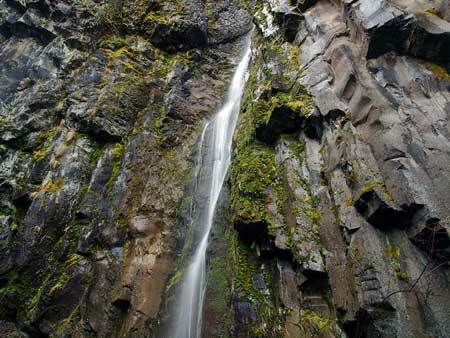 A great way to end this hike is with a final stop at magnificent Starvation Creek Falls, the star attraction in this part of the Gorge. To reach the falls, head past the restrooms, and take the spur trail on the right. A string of streamside picnic tables make this an idyllic spot to relax after your hike, and enjoy a picnic lunch. The usual Columbia River Gorge precautions apply on this hike: you’ll find poison oak, ticks and sheer cliffs, so it’s not a great choice for kids. If you’re bringing small kids on this hike, consider just hiking the lower portion to Lancaster Falls, where they will have plenty to enjoy without steep trails or dangerous exposure. The steepness of the hike makes it a good candidate for cool weather, too. Hiking poles are especially helpful, and dogs should be leashed on this trail. 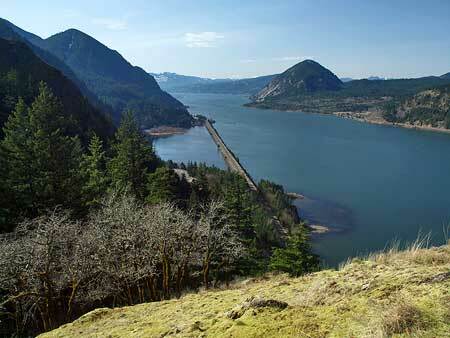 The trailhead is at the Starvation Creek rest area, located at Exit 55 on I-84, about an hour east of Portland. The trailhead has water and restrooms, and no trailhead permit is required. The Starvation Creek exit is eastbound-only, so to return to Portland, you’ll need to drive another mile east to the Viento State Park exit, then follow the signs west to Portland. Visit Restore Warren Falls! on Facebook for more information on the project.